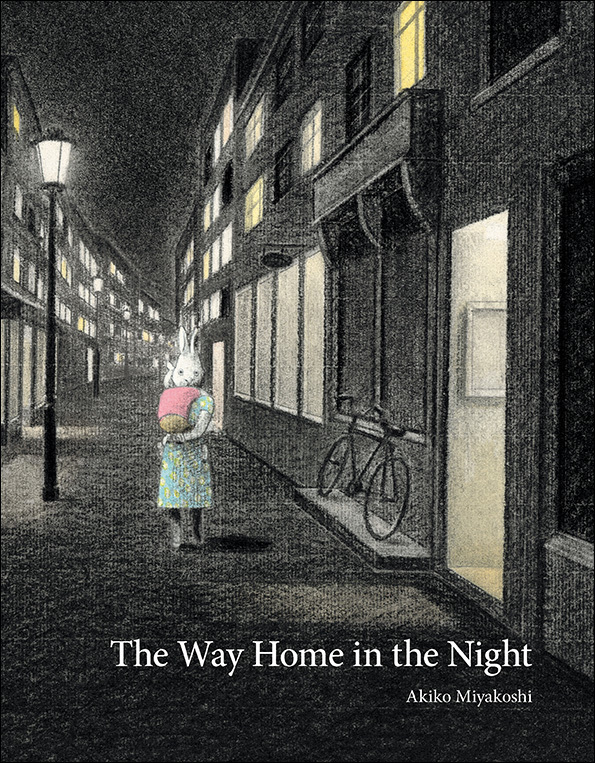 I just finished reading The Way Home in the Night by Akiko Miyakoshi (Kids Can Press; April 4, 2017), originally Yoru no Kaerimichi (Kaisei-Sha Publishing, 2015). This book caught my eye because of its bunny (one of my favorite animals!) main character and its Japanese author-illustrator. Of course I had to read it. This isn’t a cute, cuddly, fluffy bunny though. This bunny and the other animal characters rendered in pencil, charcoal, and acrylic gouache are surreal – even reminding me a bit of the Twilight Zone – but the effect is beautiful. The bunny is observing his neighbors as he walks home with his parents at the end of the day. There’s a bookseller closing his shop for the night, a neighbor watching TV, a party next door, and more. When he’s tucked into bed, he wonders about his neighbors: Is the bookseller reading on his couch? Are the party guests saying goodbye? Are his neighbors getting ready for bed, or already snug in bed like him? It’s a different take on the bedtime book, which usually shows children winding down already at home or in their bedroom. This beautiful book lulls us with a strikingly simple story that starts on the streets outside and in neighbors’ houses.